The Sebago Lake Water Treatment Facility is located on a 10 acre site near the intersection of Rt. 35 and Rt. 237 in Standish. This facility began treating water in February 1994 using ozone. Ozone is a powerful disinfectant that kills potentially harmful microorganisms and is 99.99% effective against viruses and Giardia. Treatment includes screening, ozonation, UV light treatment, chloramination, and corrosion control. Also as a result of a citizen referendum, fluoride is added to the water at the plant to promote dental health. Get a closer look at the plant by taking a tour. Tours of the Sebago Lake Water Treatment Facility are offered year-round and are conducted by plant operators and laboratory scientists. Due to the complexity of the content covered, tours are recommended for students in high school and higher learning institutions. Both the facility and the laboratory are featured on the tour. What is ozone, and how is it produced? How is the water treated with ozone? Why was UV treatment installed? How does UV treatment work? Is this kind of treatment safe for the environment? Why did the District build this facility? The federal Safe Drinking Water Act was amended in 1986 in response to concerns about drinking water quality throughout the country. The Act required that drinking water from all surface water supplies be filtered. The District applied for and obtained a waiver from this filtration requirement because of the exceptional water quality of Sebago Lake and the District's comprehensive watershed protection program. This saved customers about $20 - $50 million in capital costs required to construct a filtration plant. Many other aspects of drinking water quality were addressed by the Safe Drinking Water Act amendments including new standards for disinfection. Disinfection is the destruction of disease causing organisms such as bacteria, viruses, and Giardia. The District decided to switch from chlorine to ozone for primary disinfection to meet these requirements. Ozone is a very powerful disinfectant and it works in much less time than required with chlorine. Utilizing chlorine alone to meet the new disinfection requirements would have increased the formulation of chlorinated by-products which at high amounts are potential health threats to water consumers. 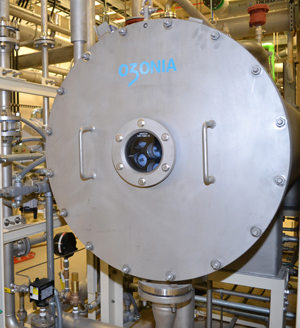 This facility was the first free-standing ozonation plant to be built in New England and the first in the country to meet the disinfection requirement of the Surface Water Treatment Rule with ozone alone. A state-of-the-art laboratory is on site and conducts water quality testing for the lake, treatment process, and distribution systems. A $12-million project to update the ozone disinfection process and install a new UV water treatment system was completed in 2014. This sustainable, forward thinking process design incorporated a new UV system into the existing plant, allowing the District to receive a $300,000 competitive grant from the Efficiency Maine Trust Competitive Program. As a result of these energy efficient upgrades, an annual electricity cost savings of $150,000 is expected. What is ozone and how is it produced? Ozone consists of three oxygen atoms joined together into a single molecule of ozone. It is produced by the discharge of electricity in air. Lightning produces ozone naturally by splitting oxygen molecules so they can recombine into ozone. 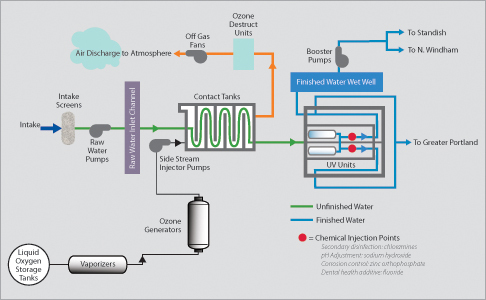 This is similar to the process used at the plant to produce ozone. Ozone generators equipped with aluminum lined glass tubes called “dielectric tubes” zap oxygen with high voltage power to split molecules into separate oxygen atoms. Some of these atoms then combine with other oxygen molecules to form ozone. Ozone is then injected into the water in the contact tanks. As ozone comes in contact with bacteria, it breaks down the cell wall and destroys it. By the time the water reaches the end of the contact tanks, disinfection is complete and the ozone has converted back to oxygen. Up to 52 million gallons per day can be pumped from Sebago Lake through the ozone contact tanks. As a result of new federal regulations, additional treatment is required for purification. EPA’s Safe Drinking Water Act Long Term 2 Enhanced Surface Water Treatment Rule focuses on the pathogen Cryptosporidium. During a two year monitoring program PWD never detected Cryptosporidium in the water; however, the new treatment provides additional levels of protection from potential contamination in the future. UV treatment has been used for drinking water disinfection in the U.S. since 1916 and is proven to be effective at inactivating Cryptosporidium. During the UV water purification process water is sent through units equipped with UV lamps. As the water is exposed to the UV light, molecular bonds in the DNA of viruses and bacteria are broken down, rendering the bacteria harmless and unable to reproduce. Chloramines are added in the pipeline after UV treatment to provide long lasting disinfection in the water mains. Other additives are also used to help reduce corrosion. Treated water flows from the clearwell into the transmission mains. To avoid adding ozone pollution to the lower atmosphere, blowers draw air out of the enclosed contact tanks through special equipment which converts any leftover ozone back to oxygen. The "ozone-free" air is then discharged to the atmosphere. 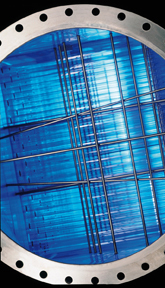 UV disinfection is a purely physical process which is proven to be more effective, reliable and environmentally friendly than chemical disinfection. Large electrical generators are located at the facility so that pumping and treatment can continue even when the power fails.